A PIONEERING initiative to recruit and train pharmacy staff in NHS Dumfries and Galloway has been recognised with a national award. 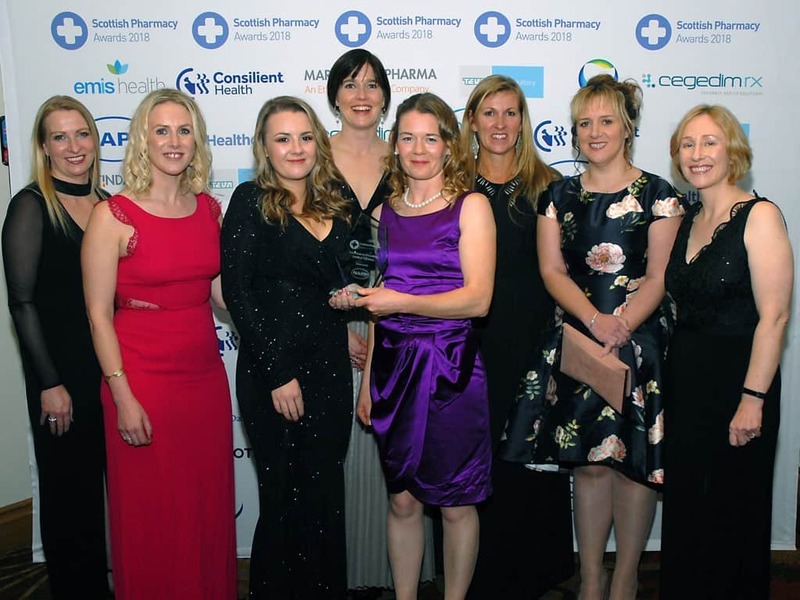 The project recognised at the 2018 Scottish Pharmacy Awards was launched in Wigtownshire three years ago with finance from the Health and Social Care Integrated Care Fund, and after proving successful has rolled out across the whole of the region. Locality Prescribing Advisor Amy Robinson originated the idea, and said: “It’s well known that we have a need to recruit people to work within the primary care pharmacy team. “We had faced challenges around recruitment, and with a workforce of two part-time pharmacists and one part-time technician we were unable to cover ten GP practices spread over a rural locality. “To recruit a pharmacy technician, we would traditionally be looking to find someone who had already qualified, so there was also a risk of drawing away people from much needed work in other sectors. “As a result, we joined forces with Whithorn Pharmacy, which is an independent community pharmacy, and pharmacist Fiona McElrea. “She agreed to help us create this programme which would see participants train for 15 hours a week in a community pharmacy to meet the necessary regulations with the remaining time spent with the team in general practice. “And we received funding initially to train one pharmacy technician, Eilish Bell, who I’m very pleased to say is just about to qualify. Noting the local interest in taking up the opportunity to train, Amy added: “Initially I went out wide looking for someone interested in training as a pharmacy technician, and we got something like 66 applicants. “Then in the second year we took on a second trainee pharmacy technician, and we’re just about to recruit a third. “Those who are taking part will emerge with a professional qualification, and that can be used in vast areas in pharmacy. “But obviously we’re hoping that our graduates will continue to work locally because obviously we have recruitment issues in general practice and they are invaluable; they really are fantastic. And since proving such a success, the programme has been rolled out across other parts of Dumfries and Galloway. Wigtownshire Prescribing Support Team, including trainee Eilish Bell, attended the 2018 Scottish Pharmacy Awards on 7 November at Hilton Glasgow Hotel, which ‘recognises exceptional pharmacists and showcases their accomplishments’. And they were delighted to be announced winners of the Innovations in Prescribing, Quality, and Efficiency Award. The Wigtownshire team’s awards success has been recognised by South Scotland MSP Emma Harper, who on November 8 lodged a motion with the Scottish Parliament to recognise the inspiration and dedication shown by pharmacy professionals in Scotland, and encourage the Wigtownshire Prescribing Support Team and NHS Dumfries and Galloway to ‘continue what it considers their excellent pharmaceutical work’.